The world chess rankings for chess grandmasters are calculated regularly by the World Chess Federation (FIDE). "Just reading about the various opinions concerning the conduct of the recent championship matches convinces me that the only thing to which two chess players could agree is that a third one is over-rated." Chess ratings for registered chess players are published in the world chess rating list by the FIDE (World Chess Federation) four times a year. It calculates an estimate of the strength of a chess player, which is based on his playing performance against other players. Chess rankings are used by the English Chess Federation, the US Chess Federation (USCF), the International Correspondence Chess Federation and others. 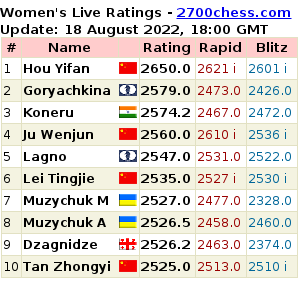 Ratings are calculated after chess tournaments and matches. 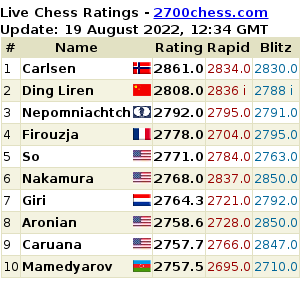 You will see below the Chess Rankings for the Top Chess Players in the World. If you join a chess club you get a chess rating as well. You can improve it by participating in chess tournaments. If you desire a chess rating then first join a chess club. This makes you a paying member as you pay the chess club membership fee. If you take part in any rated tournament after that your rating will be calculated afterwards as you are a registered chess player. Your rating will be published in chess magazines every few months or so. Garry Kasparov (retired from active chess) has achieved the highest ever FIDE rating of 2851 on July 1999 and January 2000. The chess rankings are often used by organizers of tournaments to decide which players to invite.